A decision at San Diego’s KPBS last month to stop local production for its reading service makes it the latest station to cut back on such operations, as digital platforms become more popular among visually impaired listeners seeking news and information. The station’s around-the-clock service will continue airing readings from national publications provided by the International Association of Audio Information Services, an organization that supports reading services. But it stopped airing more than four hours a day of readings from the San Diego Union-Tribune and Los Angeles Times June 30 and has filled the time with national content. The station had produced the broadcasts for decades with volunteers as readers. At the time it ended the service, it used more than 100 volunteers. KPBS is one of 39 public radio stations offering reading services, according to Lori Kesinger, IAAIS administrative assistant. Other stations and reading-service providers have also been cutting back, according to Kesinger. In 2015, Radio World reported that providers of reading services in several states had shuttered or cut back on services due to tight budgets. 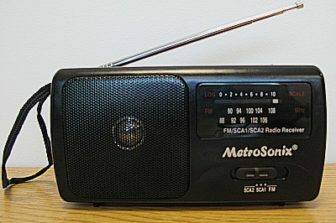 A radio used for tuning in reading services. Meanwhile, visually impaired listeners are increasingly using digital platforms such as smartphone apps, web streams and smart speakers for spoken-word news, according to IAAIS and stations. That has reduced the need for the broadcast technology, which transmits programming on a frequency within the unused portion of a station’s 200 kHz of FM spectrum. Stations buy special radios that pick up the frequencies, providing them for free upon requests from listeners. KPBS had noticed that fewer listeners were asking for radios, according to John Decker, director of programming. The station gave out just six radios over the past year. It estimates that 200 to 300 radios are still in operation in its listening area, down from 2,500 in 2000, Decker said. Readings of articles from the Times and the Union-Tribune are both available through a dial-in reading service run by the National Federation for the Blind. Union-Tribune readings are also available on Amazon smart speakers. Decker declined to say how much KPBS was spending to produce the local readings but said “it doesn’t come without expenses.” The station eliminated last month the position of a part-time employee who coordinated the service. Yet over-the-air readings can still be critical for elderly visually impaired listeners, according to IAAIS President Marjorie Moore. Many older RRS listeners didn’t use the internet before losing their sight. “That’s where those specially tuned radios come in, because they’re so simple to use,” Moore said. At WQCS in Fort Pierce, Fla., Operations Manager Joe Lenartiene said requests for subcarrier radios have also dropped. The station gave out four radios over the past year, compared to 20 to 30 per year around 2005. WQCS estimates that 500 radios are operational in its listening area. WQCS offers its RRS on Amazon’s smart speakers. The station is increasingly telling visually impaired listeners to find its service on that platform “because there are so many things you can do through that,” Lenartiene said. Update: This article was updated to include information about other platforms offering readings of the local newspapers previously heard on KPBS. The article has also been updated to clarify that KPBS eliminated the position of the part-time employee who previously coordinated the service. Station managers are making faulty presumptions about technology adoption among seniors who are blind or visually impaired. IRIS – The Iowa Radio Reading Service for the Blind – just mailed out its 84th radio for 2018. We mailed 170 in 2017, 182 in 2016 and 221 in 2015. This article misses the mark by a mile. More and more of our listeners are seniors who do not and will not use the internet. SO MANY of our listeners either don’t have internet service in their homes or cannot afford it. The custom radio receivers remain the cheapest and easiest way to keep our listeners connected to their communities. Humans reading to humans remains the cheapest and easiest way to relieve isolation and loneliness for seniors who are living with a vision loss. Andrew, I’m happy to have a conversation with you to help you understand our industry – because clearly, you do not yet understand what reading services do. Both KPBS and WQCS have one or less staff devoted to running the operations of the radio reading service. I’d challenge any station manager to try to coordinate the efforts of 100+ volunteers on a weekly basis, edit the audio, and answer listener questions while trying to market the station and send radios out, let alone collect outcomes of the service by themselves. But that’s consistently what reading service staff at public radio stations are asked to do. To turn around and say listenership is down is a direct result of a management strategy of failure by neglect. Stations with multiple staff have seen an INCREASE in listenership, both on SCA radios and digital platforms. Yes- listeners at times access reading service content digitally. And honestly, digital is great for people that can use it. Don’t expect people with vision loss to be the early adopters though. It will take 10 years, maybe more, before reading services can truly get rid of SCA radios, as much as the industry might want to. The fact of the matter is that elderly listeners do not have access to the internet and thus digital content. This is even worse for elderly people in rural settings. In a recent survey in the St. Louis region, we found only 50% of the listeners to the reading service even could access the internet. We’re giving out 4-10 SCA radios a WEEK. To say there’s no demand in places like San Diego says KPBS was not directing resources to allow the station to flourish. All of this comes down to the greater issue. KPBS says they cut the local information because people can get that digitally. Where? Their reading service is no longer producing readings from the local paper. Grocery store ads remain in inaccessible PDFs. That’s the information people crave from their local reading service and the exact content that listeners are now being deprived of. Hi Marjorie, regarding digital versions of the readings that were cut, owners of smart speakers can hear San Diego Union-Tribune readings on that platform. We had included that detail in an earlier draft of the article and inadvertently removed it — we’ve put it back in. Goodness Mike, how many senior citizens do you know that own a smart speaker? or a smart phone ? or a computer? or an ipad ? and even if they do – how proficient do you think they are with it? And how many seniors have an internet connection? Sure the well off ones who live in communities that provide that do but what about those on a fixed income? There is still a huge gap in the technology world for people with limited resources and limited proficiency with digital devices. Most listeners have multiple physical issues to overcome as well. As we move to a completely digital world we have to remember and appreciate that there are still a lot of our friends who are not able to navigate that world – but they still want to keep up with their community, receive intellectual stimulation and be entertained by print media. Someday we will all be there – trying to keep up with the changing times. I hope my fellow citizens don’t forget and discount my needs just because those 40 years younger than me do something differently.